Apologies for not embedding it, I didn’t realise until too late that this would require an upgrade on the WordPress blog, or I’d have used Blogger for this project. Books transport us to other worlds. And some people can be passionate about the experience. The traditional stereotype of a book reviewer is of a quiet unassuming type, curled up in a corner with a book. On the internet, however, many book reviewers are more likely to be crusading knights waving big swords at even bigger dragons. Book publishing is a huge business, and reviews are a huge part of that. Book reviews get books in front of readers, and can make or break a book. Until recently the book publishing industry was highly controlled, with “the big 6” publishers more or less responsible for 90% of books available in the US. The situation in Europe is only slightly more fragmented. As of this year, the big 6 is down to the big 5, and independent publishers have captured 25% of the e-book market and are making inroads into paperbacks too. Book discussions and reviewers have existed as long as books have, and book clubs from the literary salons of a century ago, to the more recent living room coffee parties have been important in the book industry. Outside the bestsellers, in what is called “the mid list”, word of mouth is the most powerful promotional tool. With the rise of internet storefronts, places like Amazon were the natural gathering point for book reviews. However, Amazon has also become a major player in the independent publishing market – you can publish a book directly through amazon in both e-book and print format, at no cost. This put two sets of Amazon customers on a crash course for each other: Authors out to promote their new books began taking on reviewers in the review space, replying to negative reviews and trying to get them removed or gathering “posses” to mark negative reviews as “not helpful”, and reviewers feeling their ability to give an honest opinion was in jeopardy. Many of the top reviewers moved on, looking for a new home. While there were several alternatives, GoodReads was the most successful, recently topping 20 million users. Forbes magazine credits GoodReads reviewers with the ability to “break” a new book into a best seller, noting that this is where the buzz for 50 Shades of Grey began. Amazon’s forums meanwhile became effectively a wasteland of mostly positive reviews and authors attempting to sell to each other. And all was happy in book review land until Amazon bought GoodReads and the site began re-targetting itself as a platform for authors to make sales. After a few scuffles between authors and reviewers, a major scandal broke out over the summer of 2013 which reached the pages of the New York Post and Salon magazine, and garnered GoodReads a lot of bad publicity. So by the end of September, a new policy was put in place outlawing any mention of author behavior in reviews, and as happened at Amazon before, a vocal group of the most prolific reviewers left the site in protest over censorship. This time around, many left to review on their own blogs, and the diaspora is a lot more splintered than the last few mass migrations, but a fairly large subset decided to settle on BookLikes, making it a particularly interesting place to investigate just now. BookLikes users are almost exclusively book lovers, primarily heavy readers who like to write reviews and/or keep a record of their reading. The major feature that differentiates BookLikes from other blogging or micro-blogging platforms, particularly Tumblr, is the bookshelf feature; Without the bookshelves, this would be more or less a Tumblr clone, and there wouldn’t be much point choosing it over the original. This feature provides a comprehensive reading record for anyone who wants to make use of it, and guarantees a focused audience of other book-lovers for posts. The site is very active, primarily during US daytime hours, despite being based in Europe, but there is traffic at all hours of the day (and the traffic I see is different than what others see, based on who we each follow). Some of the busiest posts can receive dozens of comments, and seeing interesting comments on a friends posts is a prime way to find more people to follow, creating a friend of a friend network. As a fairly new site, the possibilities are endless. New features are being added every Thursday, some of them major; Last week were added discussion groups, which i didn’t take up in the video as they are very bare bones yet, effectively comment threads that belong to a group and it’s administrators rather than a specific blogger. 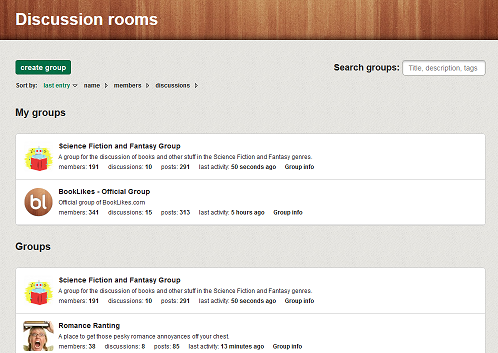 However the possibilities to run formal book clubs via these groups is certainly there, as more features are added. These also give the possibility of interaction with more people you don’t already know, further extending your network. It’s also possible to view a book blog externally, without being a member, allowing a BookLikes blog to replace standard blog platforms, so users can take advantage of the book categorization features while still having a publicly accessible platform. (You can see mine here, for instance). One can also create widgets and buttons to use in other websites, (WordPress requires an upgrade to use these, or I would add one here), driving traffic from other platforms back to BookLikes. That said, as a new site and with features being added rapidly, there are occasional glitches and bugs, and users have a limited amount of patience with these when it leads to content going missing. Book reviews are often given in return for a free copy of the book, and US FCC regulations require reviewers to acknowledge this in their posts, which most are happy to do, however there is really no way to enforce this. The EU does not appear to have any such regulations I can find, but I do notice that most reviewers do acknowledge free books in any case. This has been a regular issue on other book sites, particularly Amazon, where paid reviews are a big problem. At this point, BookLikes only partially aggregates the reviews for specific books into a single place, for instance reviews of the hardback, paperback and e-book editions may not be listed together, but this is noted as a future feature. When that happens, it’s to be expected that some of the issues present on other book sites with authors demanding negative reviews are removed may occur, but at present the site has not seen any of this, and the site owners have publicly stated they will not remove honest reviews no matter how negative they are. At present the site tends to provide a wide range of views on most books, from avid fans to negative opinions, allowing the reader to make their own decision on whether to read a book or not. The commenting function tends to encourage longer, more in depth reviews, as these are the ones that engender follower engagement, and some posts create a lengthy discussion. As a reader, it provides exposure to a vast range of genres, including those that I’m not habitually a reader of, with the downside that my “to read” shelf is now ridiculously large and growing daily. Booklikes logo from Booklikes.com, screenshot of BookLikes taken by me. Hi Laurie, I think you explain the general purpose of the netculture BookLikes (i.e. 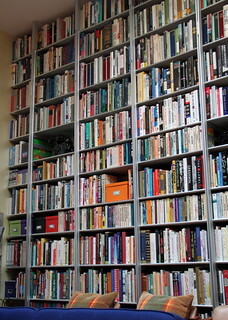 tumblr with a bookshelf feature), but I would challenge you to use a screencast. This illustrates the every-day-life of you as a community member. I also se you have a widget in the right sidebar linked to BookLikes.com, how does this work? Interesting that you can see the widget: I did mention that in the post, but removed it because it doesn’t show up here. BookLikes provides the code, but it uses an iframe and I assumed it was also a premium feature, in fact I changed the blog text to mention that too. How odd. Oh, I skipped the top (the title and picture attracted my attention :-). Noe it was easy to follow! Your screencast gives a good overview of the community. And the background and about writing on your blog is interesting. Your previous assignment was also about books, I would like you to go outside your comfort zone to get some more input. By reading and watching the other students blogs you will discover lots of new communites. You are currently reading Meeting Places: BookLikes.com at A Blog By Any Other Name.